The monastery Ravanica, with its church of the Ascension of the Lord was built by Prince Lazar between the seventies and eighties of the XIV century. 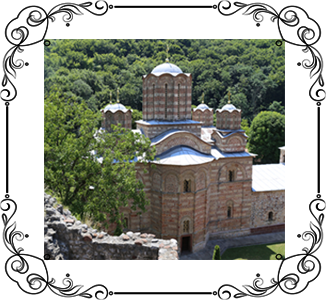 The monastery Ravanica and its church of the Ascension of the Lord occupy an especially important place in Serbian medieval history, both because of their historical role, and because of their importance for the development of Serbian architecture, ornamental sculpture and painting. Two transcriptions of the foundation charter are extant. According to the first, from Vrdnik, the charter dates from 1381, and according to the other, the Bologna transcript (still not published in full), Ravanica dates from 1376/1377. 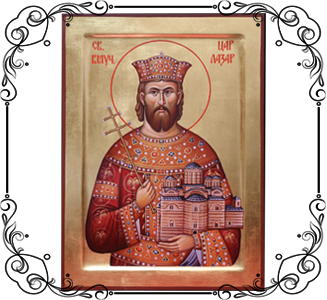 From the Life of St. Romylus, however, who is known to have lived for a time in Ravanica and died there in 1375, it is clear that Ravanica already existed in his time, not a complete establishment but a newly founded monastic estate. A monastery such as Ravanica once was, with church, refectory, cells, hospital, farm buildings and fortifications, would have been built over a period of years.According to the Life of St. Romylus, to the entries of an early Serbian chronicler, and to the fresco in the church showing the family of the founder (Prince Lazar, the founder, Princess Milica and two of their sons, Stefan and Vuk), it is quite certain that the building of the entire monastery lasted at least from 1375 to 1384, if not until 1386/87. In June 1389 Prince Lazar was killed fighting against the Turks in the tragic Battle of Kosovo, and was very soon canonized (in 1390/91) by the Serbian Church and his body was carried from Kosovo to Ravanica. Ravanica, where Lazar`s relics rested, became a center of pilgrimage and the focal point around which developed the cult of the martyr Prince and the heroes of Kosovo who had fought with him. Among the fairly numerous preserved homilies of the new saint, two were written by Ravanica monks at the end of the fourteenth or the very beginning of the fifteenth centuries. Thus right from its foundation the monastery was a center of culture in which written literature was fostered and very likely oral, folk literature as well. It can hardly be chance that the number of folk poems have come down to us about the building and later the reconstruction of Ravanica. At least some of the famous Serbian national poems written in honor of Kosovo and the Kosovo heroes had their origin here. Most likely throughout the whole of the fifteenth and sixteenth centuries, and quite certainly through the seventeenth and eighteenth, Ravanica was a monastic school. Indeed the names of number of its seventeenth-century teachers are known. The Ravanica monks were not content simply with transcription but themselves wrote original works, mainly chronicles. Some of these are short notes without literary claim, but some are longer and more important compositions which, in condensed form, and with a real feeling for words, give an account of various events and show the atmosphere of the times in which they were written. After the abortive Serbian rebellion of 1689-1690 the monks who survived had to flee from Serbia and their ruined monastery, taking to Austria not only the relics of Prince Lazar, and their most valued books and liturgical vessels, but also a tradition of written and the oral literature of the Kosovo heroes. It was not by chance that Vuk Karadzic, the nineteenth-century Serbian collector of folk literature, found the finest Kosovo poems in Srem, near Vrdnik monastery, renovated by the Ravanica monks who had fled from their own monastery and built a new Ravanica in Srem. Neither is it chance that Hieromonk Stefan, the only Ravanica monk who managed to get back to his old monastery in 1717 when Serbia was liberated from the Turks in the Austro-Turkish wars, not only began immediately to repair the ruined church and monastery, but took up educational work, as well. Whole generations of future priests and monks were his pupils. This educational activity, the cherishing and fostering of national consciousness, the maintenance of a spirit of resistance and the urge to fight on for national liberation naturally brought the Ravanica brotherhood into constant conflict with the Turkish occupation authorities (of this there are many written records, especially in the seventeenth and eighteenth centuries). Thus Ravanica, for the whole six centuries of its existence, was constantly the target of Turkish reprisals. The monastery was destroyed and burned several times: 1396, 1398 and 1436. But it seems that the church did not suffer in any of these early conflagrations, only the monastery and its fortifications. So much can be inferred from the account of Mark Anton Pigafetta, who visited Ravanica in 1568 and who recorded his wonder at the beauty and state of preservation of the frescoes. The church does not seem to have suffered serious damage until the end of the 17th century, 1686/87, when a number of Ravanica monks were killed. The church buildings and fortifications were then demolished and burned. When Hieromonk Stefan returned to the deserted monastery in 1717 he found church overgrown with trees, so that the door was no longer visible. The narthex was in such complete ruin that only the foundations remained and trees were growing all over the church. Rebuilding began in the same year and when Stefan died in 1729 it was still incomplete. He had the cells and refectory rebuilt, and had a new narthex erected in the foundations of the old one, using old material from the ruins. He also had repairs begun on the church. From his time, most likely, dates much of the discreet retouching of the churchpaintings. Frescoes which had been damaged were retouched and parts which had been completely destroyed were painted anew (for example, the lower parts of the figures of the Church Fathers in the sanctuary. He had the new narthex paintedwith frescoes, respecting the fourteenth-century frescoes where they survived (i.e. in the south niche of the east wall of the narthex) and confining himself only to restoration of the damaged lover sections. Only the two lower rows of the frescoes which Stefan had painted are still preserved. Although they cannot compare artistically with those of the fourteenth century, still they do have a certain value, and some of them are among the best wall-paintings of the time (the figures of Sts. Tryphon and Protasius, and the damaged and faded portrait of Stefan himself). Ravanica suffered new ruin at the end of eighteenth century when fighting against the Turks was resumed, particularly during the Austrian-Turkish war (1788-1791) in which the monks took an active part. But the indefatigable brothers began repairs in 1794. Later when the struggle for liberation took hold, in the First Serbian Uprising, and with help of Karageorge Petrovic himself, the monastery was again renovated. The inept restoration of the frescoes in the upper part of the narthex probably dates from 1850 when other repairs were made on the church. At the same time work was done on the outside walls of the church and on the ornamental stonework. Finally, after the Second World War, Ravanica was one of the first great Serbian monuments on which systematic conservation work was undertaken.